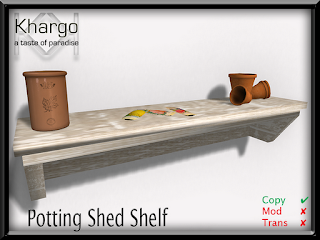 Summer is just about here and I'm spending more time outside in the garden, so we made this cute Potting Shed Shelf as the Khargo Hunt Prize for the Get the Newbie Hunt from 3rd June to 30th June. All the details of hunt prizes and hints can be found on the iTouch Hunts Blog. Hints should also be found on the hunt signs in store. Hunt prizes are 1L$.